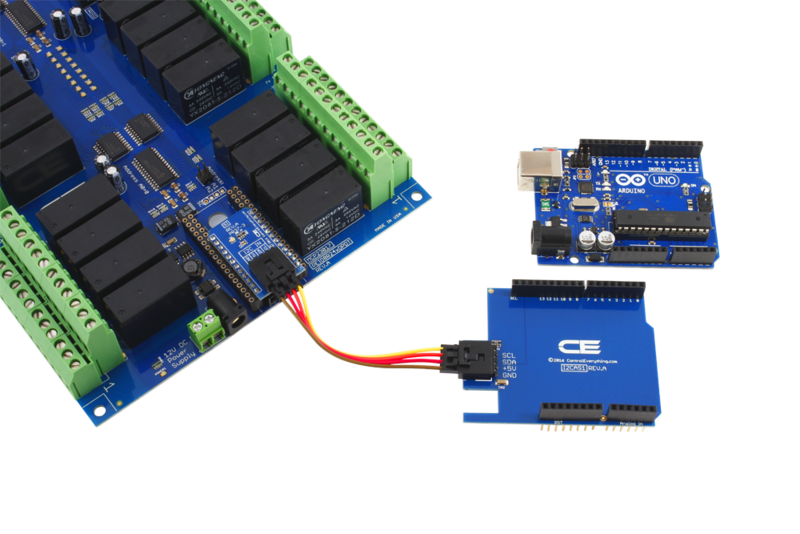 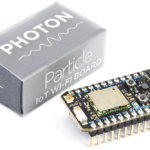 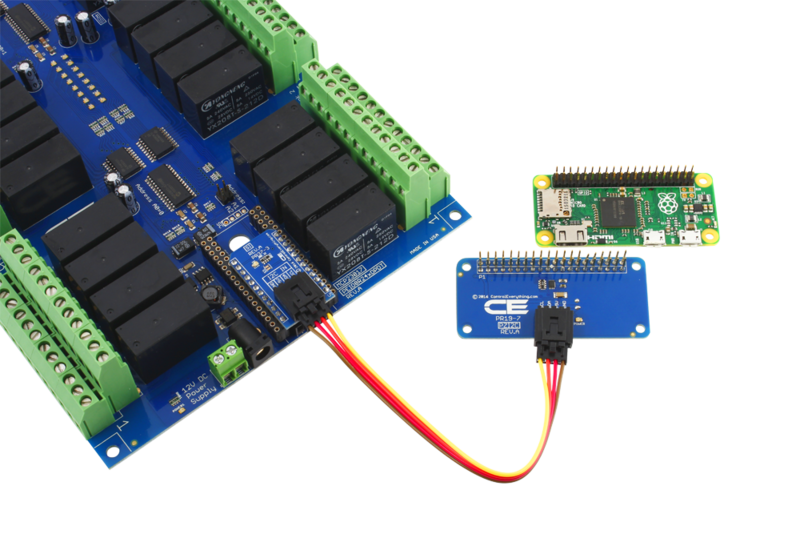 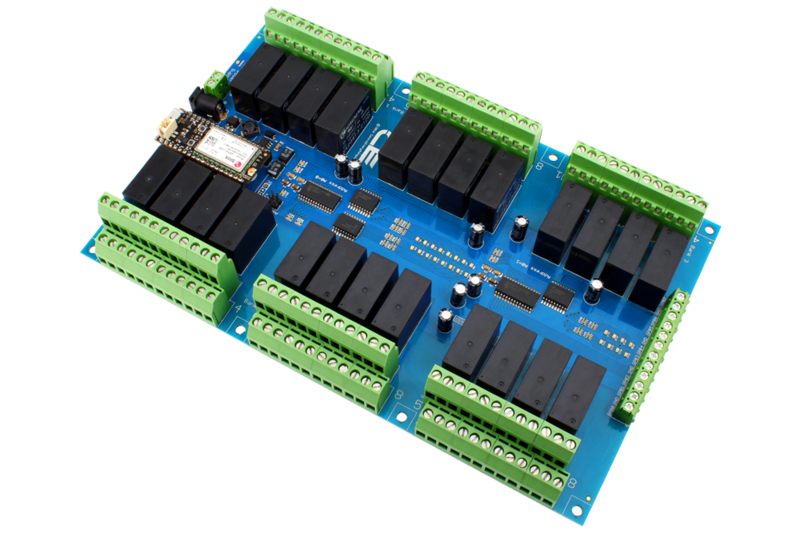 This IoT 24-channel DPDT relay controller was designed to function as a shield for today’s most popular IoT communication modules, including Particle Photon, Electron, Bluz, Arduino, and many more. 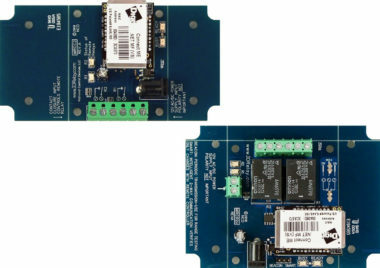 On-board DPDT relays are ideally suited for control of telecommunications, audio, and other low-power switching applications. 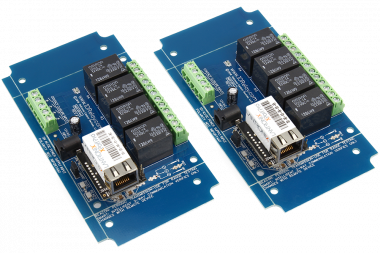 Each DPDT relay contains two separate switches that switch simultaneously with 6 connections for each relay. DPDT Relays are available in 1, 3, or 5-Amp versions, customized when added to your shopping cart. 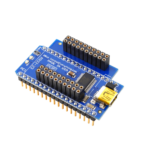 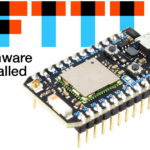 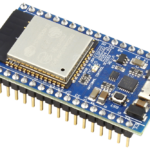 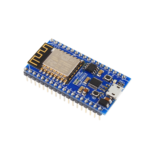 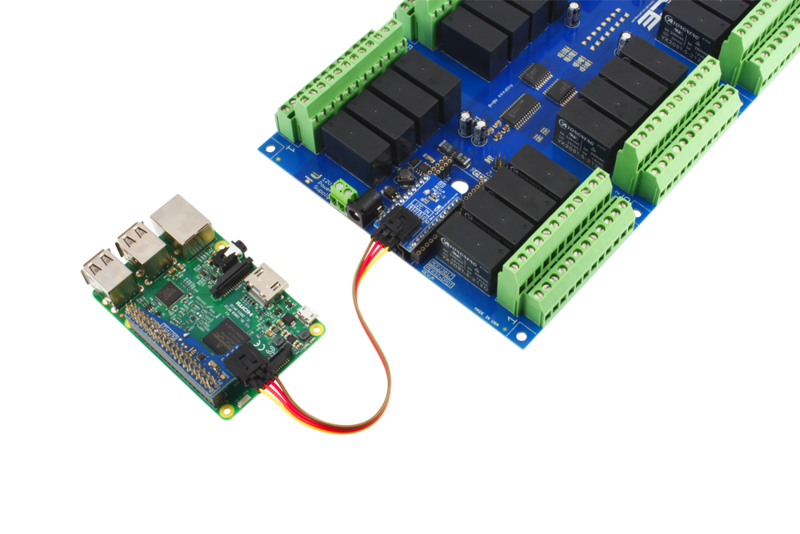 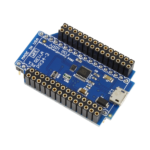 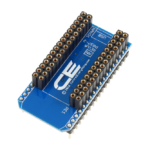 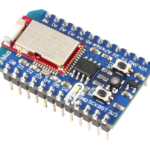 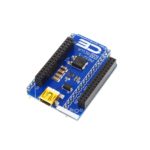 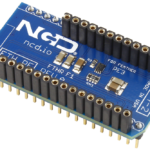 This controller is based on dual MCP23017 controllers, a common I2C interface chip for GPIO applications. 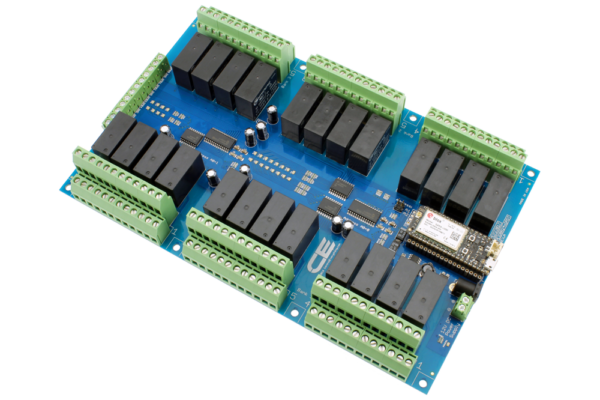 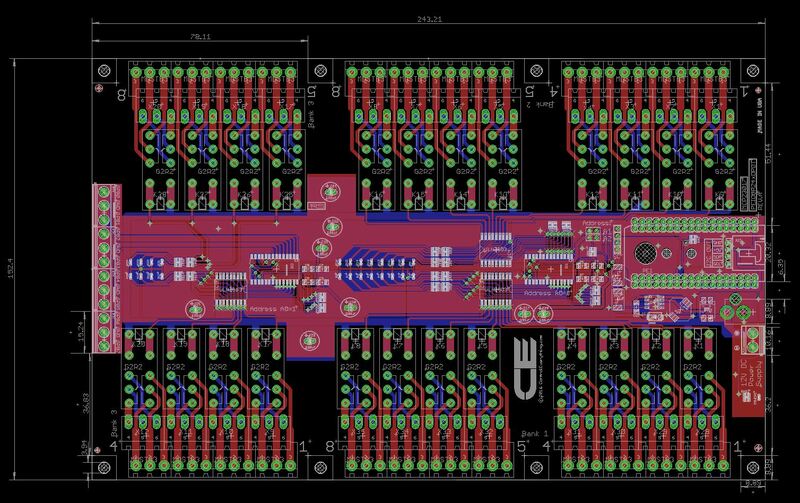 In this design, the GPIO port is used to control 24 on-board DPDT relays. Eight programmable Digital Input/Output port pins are also available via screw terminals for use in Contact Closure detection applications or monitor and control external TTL circuits. 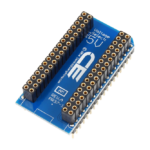 The I2C bus support up to 8 similar devices (based on the MCP23008 or MCP23017). 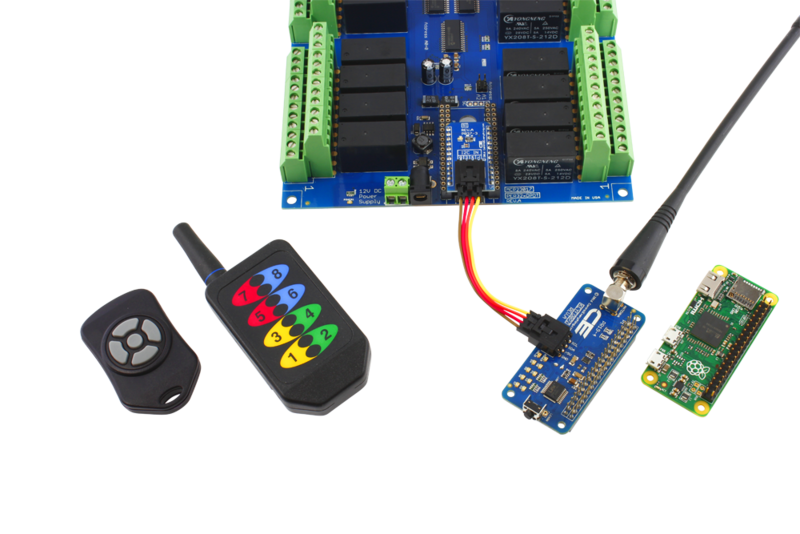 This controller counts as two devices on the I2C bus. 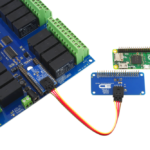 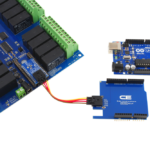 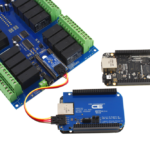 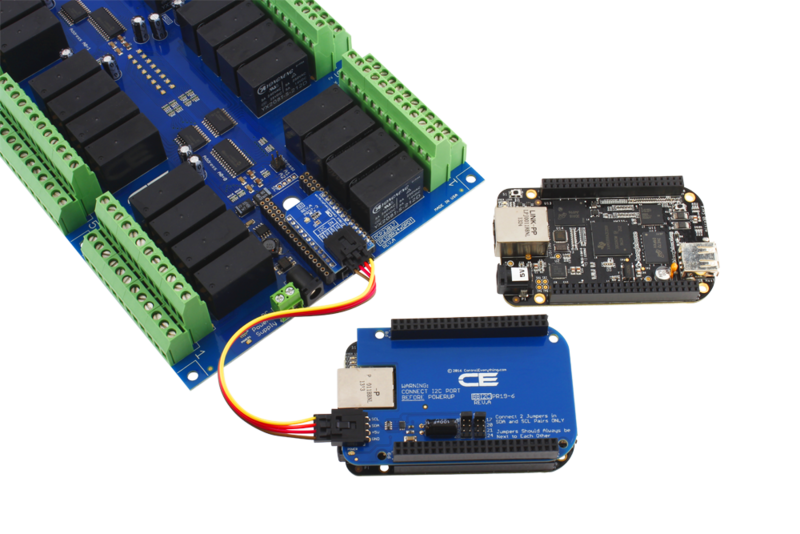 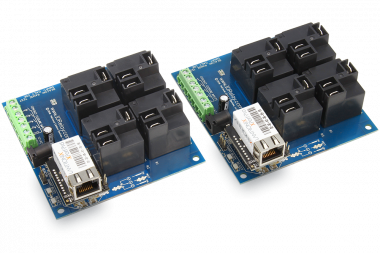 Two on-board address jumpers set the I2C start address of both MCP23017 interface chips. 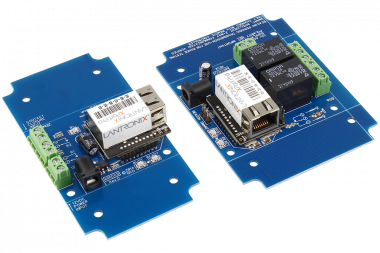 On-board status LEDs display the on/off status of each relay. 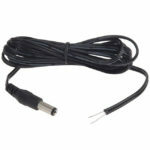 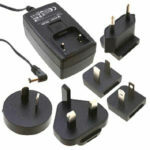 This controller may be powered using our optional power supply or with 12VDC and direct screw terminal connection of bare power wires. 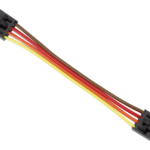 Each relay is accessible to the user via screw terminals, capable of accepting 14 AWG wire. All relays on this device are of the DPDT variety, which are essentially two SPDT switches inside each relay that switch simultaneously. 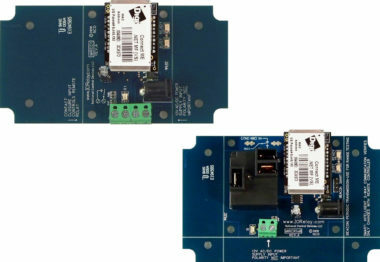 Each relay has two sets of 3 connections to each relay: Common, Normally Closed, and Normally Open (2 sets, 6 total connections per relay). 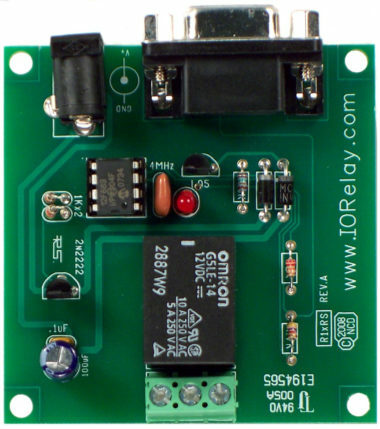 The Common connection is always connected to the Normally Closed connection when the relay is off. 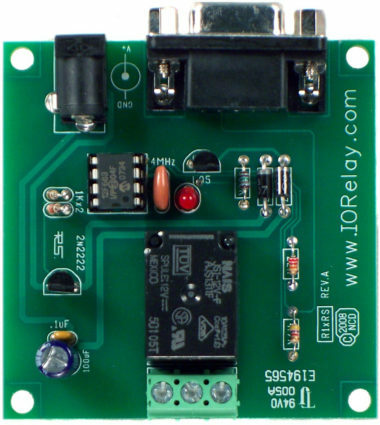 When the relay switches on, the Common connection is disconnected from the Normally Closed and Connected to the Normally Open. 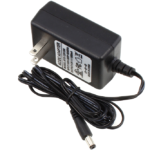 External loads may be wired to be off all the time and turn on when the relay turns on. 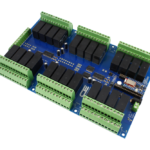 Optionally, external loads may be wired to be on all the time, with the external load switching off when the relay is activated. 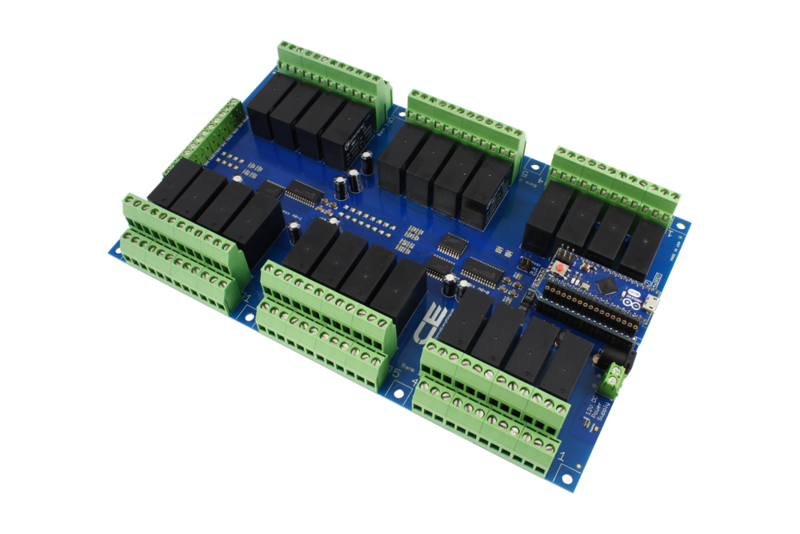 Relays are rated at 5 Amps 250VAC or 5 Amps at 24VDC. Relays are controlled using the MCP230xx Series Programmable GPIO Port Expanders from Microchip Technology. 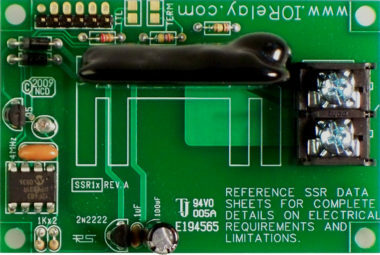 The first MCP23017 on this circuit board has the address line A0 connected to ground. 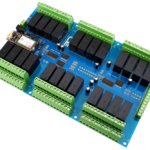 The second MCP23017 on this circuit board has the address line A0 connected to +5VDC. 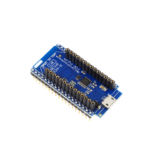 This prevents on-board address conflicts. 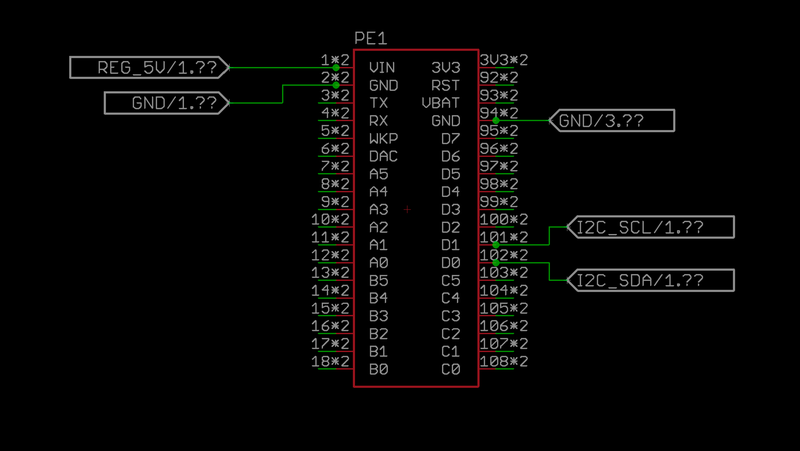 The remaining address jumpers A1 and A2 are jumper selectable. 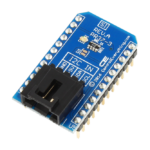 Relays are controlled by a MCP23017 using GPIO0:7 on Port A and GPIO0:7 on Port B. 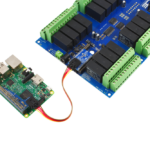 Controlling on-board relays is easy: Set GPIO0:7 as Digital Outputs. 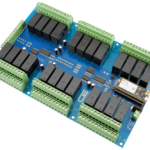 Next, set the on/off status of GPIO0:7 to activate the corresponding relays. External 8-Channel GPIO port connections are controlled by the second MCP23017 of this controller, with the GPIO mapped to Port B. LEDs indicate the status of on-board relays. 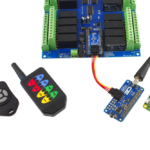 All of these operations are handled for you when using the drivers supplied in our GitHub repository (ControlEverythingCom). 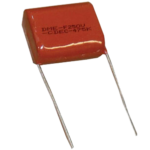 Induction suppression capacitors are strongly advised for inductive switching applications (anything that generates a magnetic field). 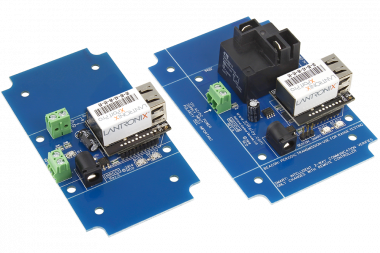 Induction suppression capacitors will prolong the life of the relays and help prevent malfunctions when switching high voltages.